American spikenard is a perennial, herbaceous plant, 3-5 feet tall; its thick, fleshy rootstock features long, thick roots and produces one or more branched stems growing up to 6 feet high. Stems are smooth, dark green or reddish. The leaves are alternate and usually ternate, 6-21 toothed, pointed leaves, weakly heart-shaped, with doubly serrate margins. Its tiny, greenish-white flowers grow in panicled umbels during July and August. The dark purple berries are pleasantly flavored and can be made into jelly. 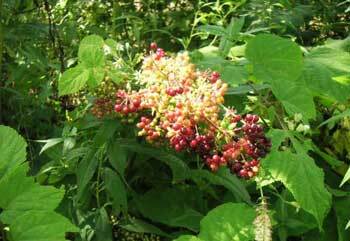 The Chinese have a plant they label spikenard (Nardostachys jatamansi). A decoction of this plant is used for skin diseases and a bath to give fragrance to the body. Found in rich woodlands in eastern North America, as far south as Georgia and west to South Dakota and Missouri. Used for pulmonary diseases, digestive weakness, gynecological problems, blood purification, hay fever, diarrhea, colds, bronchitis, sore throat, fever, venereal disease, rheumatic aches and pains, asthma, coughs. Externally, used for skin diseases and hemorrhoids. Taking the tea for some time before labor is said to make childbirth easier and shortens the labor. Native Americans used the root for wounds, boils, acne, pimples, blackheads, rashes, swellings, bruises, inflammations, and chest pains. For the external use, the root was pounded and made into a poultice or dressing. Favoring for liqueurs and cordials. Infusion: steep 1 to 2 tsp. powdered rootstock and roots in 1 cup water. Take 1/2 to 1 cups a day in small doses.